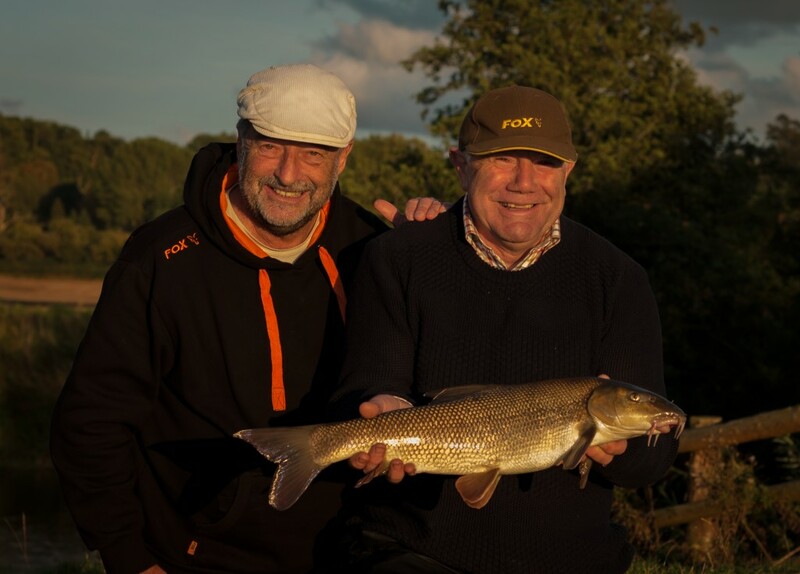 Bob needs little introduction and his exploits in the highly acclaimed BBC series A Passion for Angling have been a constant source of inspiration throughout my own angling life. Fast forward to a late September morning and a pre-dawn drive from Yorkshire saw us in a sleepy hamlet a few miles upstream of Hereford as the weather closed in and the pewter-coloured clouds loomed low over the welsh hills in the near distance. We were greeted by Bob with bacon and egg sandwiches, coffee and a chat with the man himself and his angling journalist friend, Steve Martin, who joined us to lend a hand. 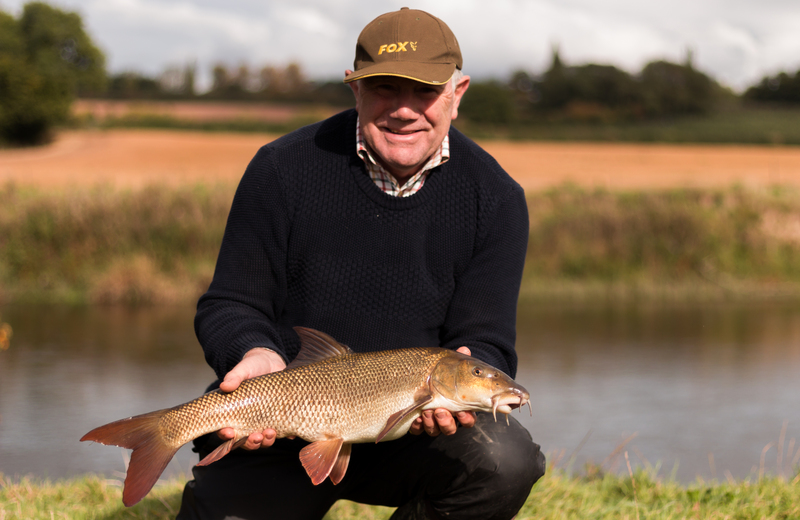 “I suppose we ought to go down to my river and catch some barbel,” Bob announced after a leisurely start. Bob’s stretch of the Wye opens with a huge, deep sweeping bend (home to some gargantuan river pike!) and courses for a mile or so downstream in a protracted loop. A guided tour of the swims followed, each of which looked as though Bob had taken the time to personally hand-pick. Brooding, tree-lined deep glides gave way to shallow, gravel-strewn rapids and wider runs, all of which wouldn’t have looked out of place in his famous series. After perusing each spot and loosely discussing tactics, we selected swims and set about baiting up. “The longer you can sit on your hands and let the fish feed on your bait the better,” advised Bob. 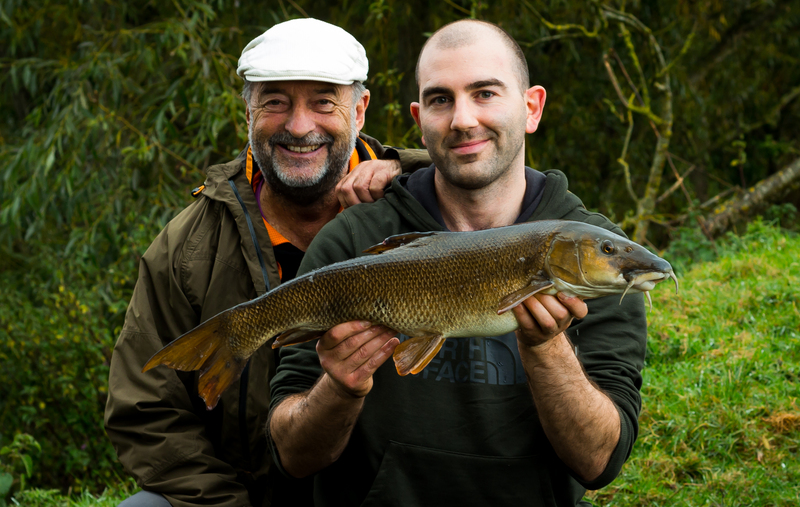 Having done a fair bit of barbel fishing in my time (mainly unsuccessfully I might add) I stayed to help set my dad up in his swim and introduce a bit of bait to see if we could get him off the mark quickly. The weather closed in and heavy rain threatened to dampen our enthusiasm but it wasn’t long before dad couldn’t resist a cast. Within minutes his rod was jolted with 10,000 volts of pure energy and the fight was dogged and determined as the fish sliced through the tinged water, the line slashing the surface film as it bolted from one weed bed to another. Standing poised with the net I spotted a coppery flash as the barbel shimmered with raw power, fighting to elude capture. Eventually the prize was eased to the surface and, after one last customary swimmer’s roll, it was turned in the direction of the waiting net. It was the start of a terrific afternoon’s sport for my dad and I was delighted he was the first off the mark. Whilst helping out I’d managed to sneak to my swim and lay a trail of ground bait and free offerings. 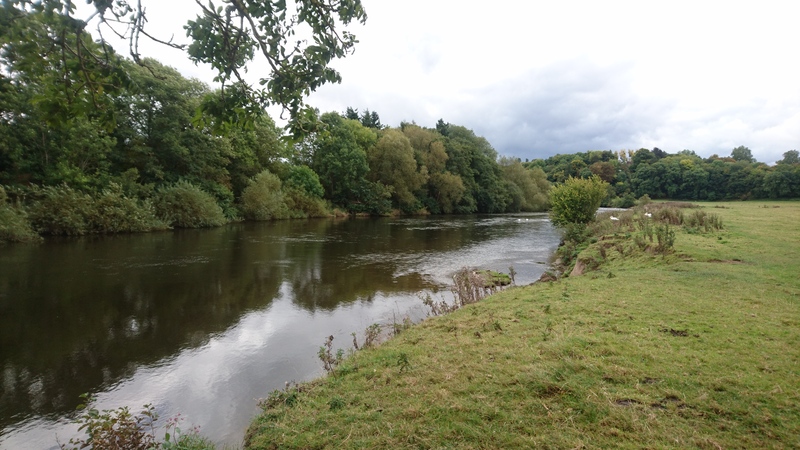 I was understandably eager then to have an opportunity to acquaint myself with one of the famed Wye barbel so, after a few photographs and a moments reflection with the old man, I headed to make my first cast. I’d barely walked a hundred yards before a shout brought me back on netting duties as he chalked up his second barbel in just a few short minutes. Repeating the unhooking, weighing and photographing process I promptly legged it to my swim before he had the opportunity of delaying me further. Rigging up with a long hook length and a trimmed down and heavily glugged SLK boilie, I flicked the bait out and down into depths. I wasn’t expecting there to be an instant response but having seen dad land a brace of fin-perfect specimens in double quick time I had a glimmer of hope that something would find the bait before too long. When the take came it was terrifying, as most barbel bites are. The rod was unapologetically ripped from the stand as the barbel used both it’s own strength and that of the river’s to land the opening blow in my first bout with a barbel in quite some time. The rod remained arched from the first moment of the fight to the last as I was subjected to the kind of fight that make these Wye barbel much revered. Before too long the brassy flank of another stunning specimen was creating a wake across the broken surface as it was enveloped in waiting net. No sooner had I landed it than Bob arrived in my swim so, not wanting to miss a golden opportunity, I grabbed him to have a quick picture of the two of us and kicked off my trip in style. The size of the fish became an irrelevance as the moment took on much more significance. With dad doing the pictures it was certainly a personal angling ambition that held more weight than mere pounds and ounces. Soon after slipping back my prize I found myself back downstream tending to another capture. This time weight did become a factor as dad managed to land a stocky fish which, despite it’s apparently diminutive frame, sent the scales to over 10lb. He was obviously delighted after taking a hat trick of fish and surpassing such a noteworthy milestone in the process. After another quick stint behind the lens I returned to my swim to commence round two of my afternoon. 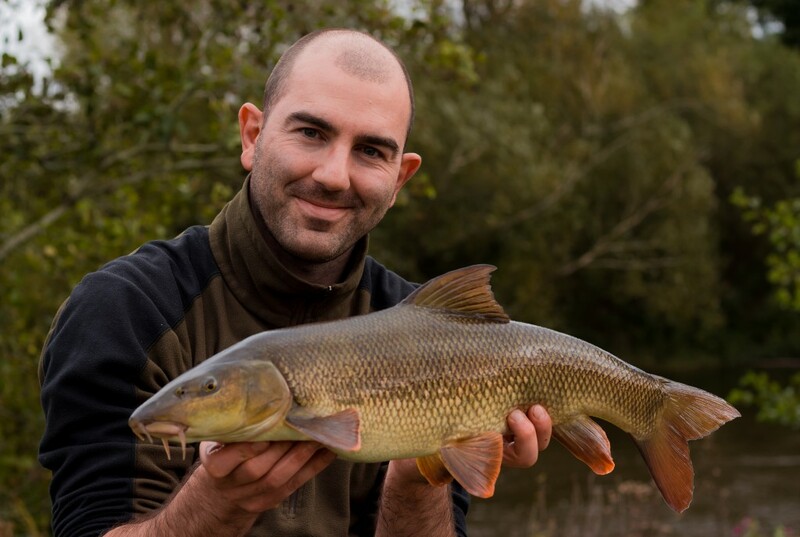 The feeder cannon-balled into the swim and the hook bait barely kissed the surface when, much to my absolute astonishment, the rod lurched forward as barbel number two sought to make a bid for freedom. Being a predominantly bottom feeding species you can forgive my incredulity at the cheek of this particular fish for taking the bait off the surface. The fight was equally as spectacular as the first as the reel’s drag audibly protested the sudden exertion of pressure on it’s working parts. Soon enough a second, much larger barbel was cajoled to the surface and, at 9lb 10oz and a few ounces under my current personal best, I was absolutely thrilled. The afternoon perked up weather wise, but my swim become dormant not long afterwards so, with dad on a streak of fish, I helped as he landed a further two autumnal beauties. As a glorious sunset broke out it was dad’s turn to be snapped with Bob and, not long after, Matt joined us before we called time for the day and headed for pizza, beer and an evening in the company of a man with many an interesting anecdote up his sleeve. Tales of outwitting the yanks at pro-bass fishing tournaments, kamikaze cows on old English estate lakes and a comical run in with the Queen Mother kept us thoroughly entertained before common sense prevailed and we got our head’s down in anticipation of the next day’s sport. The first cracks of light the next morning revealed a dusting of frost across the Herefordshire countryside and arriving back down at our spots shortly after another hearty breakfast, the river had conspired to rise quite significantly and take on a much darker character. There was no doubting the cold, sediment-laden water pushing down from the Welsh hills would make the fishing more challenging than the previous day, but it did little to deter us. 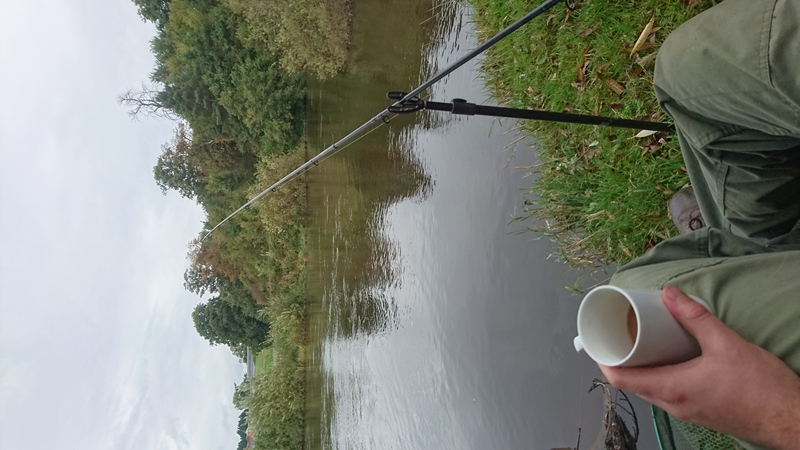 I opted to fish a deeper spot on the apex of the main bend in the river, which had a very inviting overhanging tree at the tail of the run, the perfect holding spot for a barbel to loiter. Employing the same tactics as the day before I baited heavily and left the swim to rest for an hour. Dad was much further downstream now so it was every man for himself. Matt had intended on fishing a rippling gravel run but the rise in water level scuppered his plan and so opted instead to fish above me. Getting itchy feet, I noticed that there was a small gap between the trees to the left of my swim and, if careful and quiet, I could sneak into it and present a bait.  The temptation was too much so rather than sit on my hands in my main swim, I flicked a procession of broken boilies into a deep undercut to my right and gentle wafted a hook bait down beneath the nearside bank. Sitting poised with the line tightened against my trigger finger it wasn’t long before the telltale taps pinged up the line, like morse code signalling the presence of my quarry. 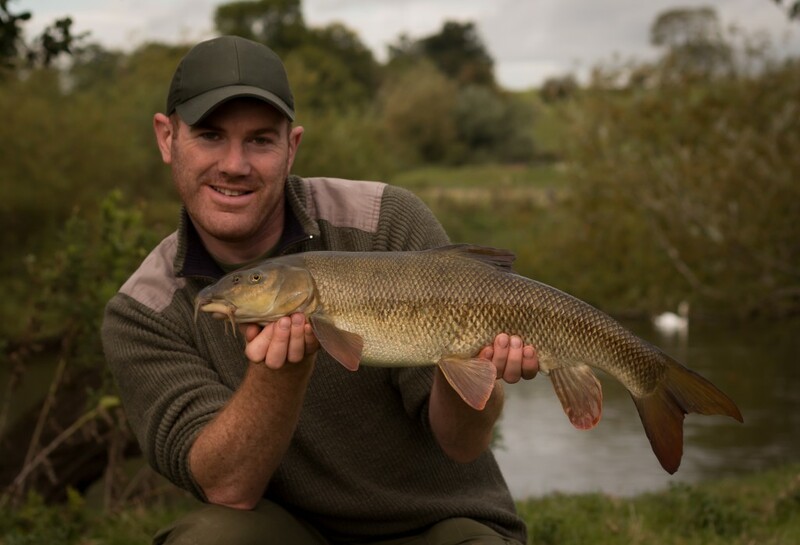 It felt almost inevitable that the tip would lurch round and when it did, the initial lunge was forceful but not of the standard of a barbel and a moment or two later a chub of around 3lbs breached the surface. 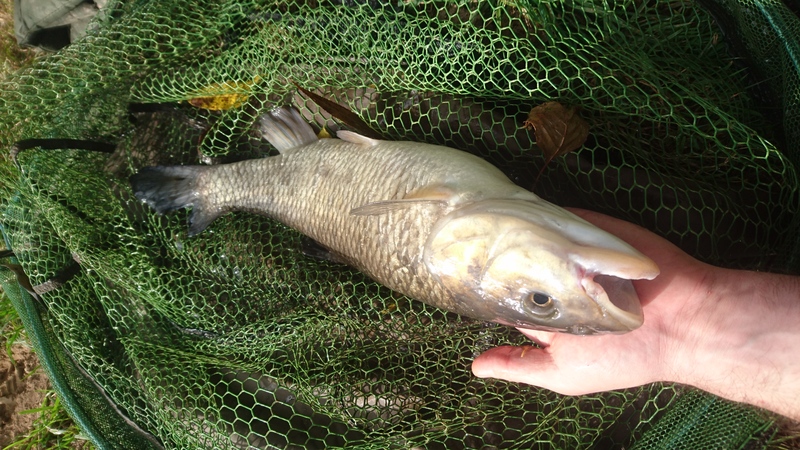 I’m always pleased to catch a chub so this one made for a nice bonus as I waited for plan A to unfold in my main spot. After a few more minutes sat in the tight confines of the ’bonus’ spot I soon become restless so decided to put plan A into action. 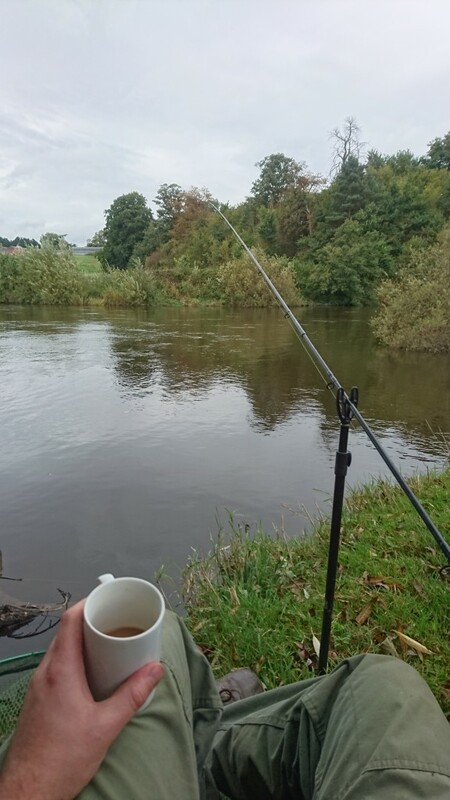 The first cast brought plenty of taps on the line but nothing conclusive and, to my surprise, a fruitless morning ensued. Matt had been unlucky the previous day and only had chub to show for his efforts but soon made amends with the first barbel of the day at around mid morning. Taking a few snaps for his album I then had a quick chat with Bob and decided it might be best for me to venture downstream to an un-exploited swim and see if we could tempt a barbel to bite. Dropping into a steadier swim, a quick briefing from Bob of the rough geography of the water in front of me saw me baiting up a line just a few feet from the bank. I again baited liberally and sat back on the ground soaking up the warming autumn sun. Bob’s stretch of river is absolutely blessed with wildlife and it was easy to forget myself as I sat in the peace and tranquillity watching all manner of birdlife and animals preparing for the onset of winter. Aside from the odd kayak and SAS helicopter (the main SAS headquarters is just over the far bank) it was almost like stepping out of the modern world. My mind eventually drifted back to fishing and the first cast brought another spirited chub. 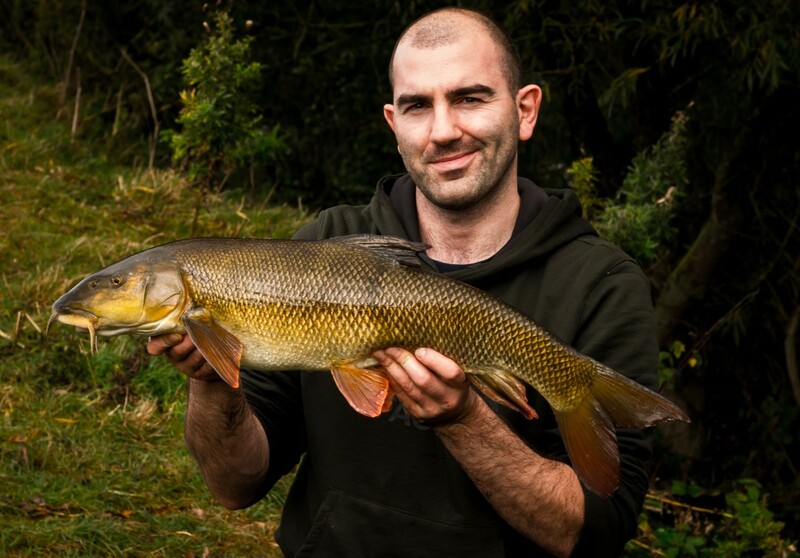 Slipping it back I wondered if luck wasn’t going to be on my side in my search for another barbel but it wasn’t long until that question was answered by another lurching bite and ferocious battle. Bob duly obliged with the photographs and I enjoyed another pleasant hour in the swim before the lure of Herefordshire apple cake and a hot cup of tea had me making my way back to join the rest of the party. Dad had struggled to locate the barbel in the swim that had proved so successful the previous day but Matt had stuck to the spot that brought him success earlier and was soon rewarded with another pristine barbel and his chance to have a picture with Bob. I dropped back into my first swim of the day to see if the last few hours of our trip might deliver just one more barbel. 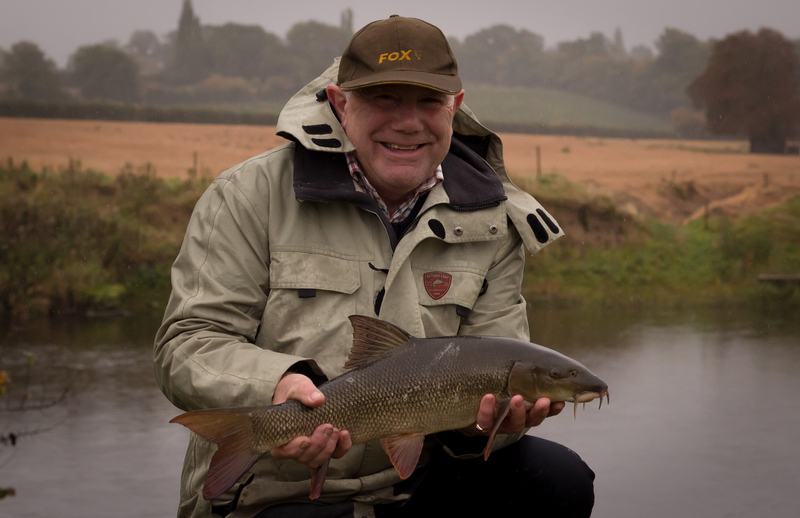 The swim had enjoyed a fair rest and plenty of free bait, but the barbel eluded me that afternoon. 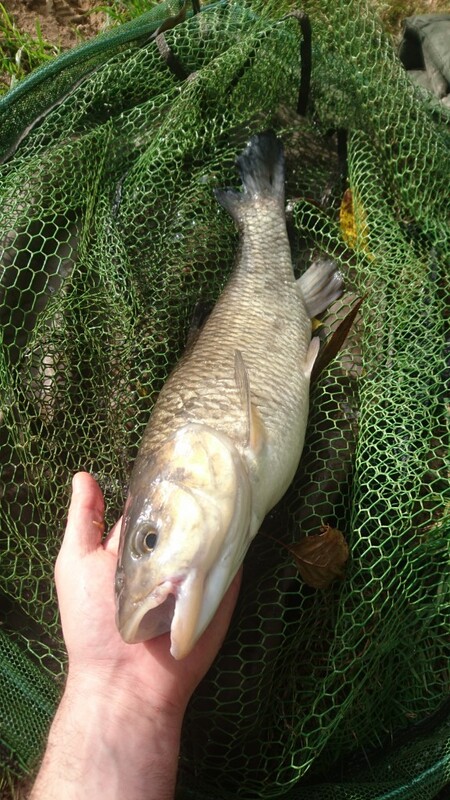 The chub on the other hand proved to be more than obliging, as a flurry of specimens ravenously devoured my hook baits. Sadly the time swept by as swiftly as the Wye’s flow and before long thoughts of the drive back up North forced us to reluctantly call an end to our mini adventure. 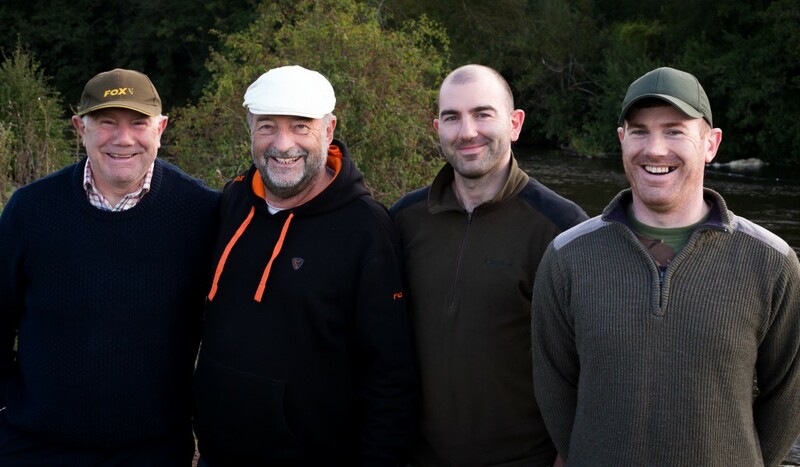 To have the opportunity of fishing the Wye for the first time was terrific, but to fish it in the company of someone who has inspired a whole generation of anglers was more than I could have wished for. Bob’s stretch of river is an untouched as you are likely to find anywhere in the UK and plans are already being hatched for a return visit next year. For anyone wanting a real angling memory I would wholeheartedly recommend contacting Bob to arrange a few days on this most splendid bit of water in the company of an absolute gent…please just don’t do it at the end of September as I intend to be there then!